I posted a tweet about Whole Foods awhile ago, suggesting it was a strong candidate for technical reasons with a solid brand name to boot. 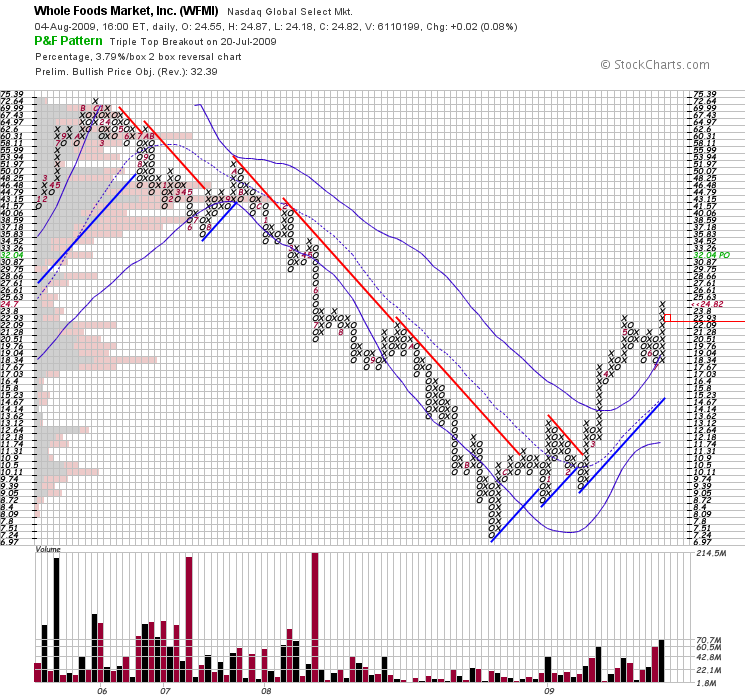 @NoDoji agreed, and today that cat tweeted a call to load up on WFMI before earnings. Much of WFMI stock has been sold short, so Tuesday’s earnings report may precipitate a covering frenzy. Looking at the after hours market, WFMI has risen $3.40, up over 13%. CHA-CHING! Technically Whole Foods remains strong, breaking out on July 20th and trading in an uptrend above a rising upper Bollinger. The price target is 32.04, but I treat this number as a guide, and not a profit taking marker. As a freelance trader and media entrepreneur raised in NYC, my waking life revolves around the market. I've moved to the fair city of Seattle to speculate, edit photos, fix computers and play the ukulele. This space is an organizational tool for ideas on risk management, fundamental analysis, technical trading, quantitative edges and participant psychology.